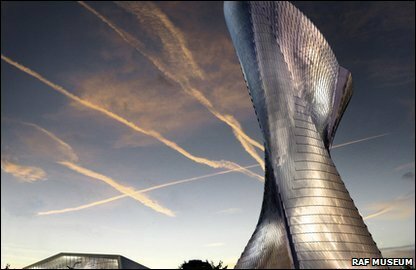 Plans to erect a striking 380ft (116m) beacon as a monument to the Battle of Britain have been unveiled. The Battle of Britain Beacon will cost £80m and be taller than Big Ben. The structure will be built at the Royal Air Force Museum in Hendon, north west London, housing an exhibition on the World War II air conflict. The museum announced the scheme ahead of the 70th anniversary of the battle, which raged in the skies over Britain from July to October 1940. The eye-catching building will be constructed out of steel and glass and feature a high-speed lift. Nearly 3,000 RAF pilots involved. Rebecca Dalley, the museum's head of fund-raising, said the exhibition would examine all aspects of the conflict: "It will look at the battle in its entirety. It will look at the involvement of the pilots who took part in the fighting and the impact it had on the entire country. "The battle will be examined from both sides. We have a fantastic collection of aircraft from both sides of the conflict. "The civilian aspect will also play an important part in the exhibition, including the Blitz." She said the museum hopes to complete within the lifetime of the remaining veterans from the conflict, now mainly in their 90s. The project is set to be funded privately, with several potential investors already having shown an interest. The museum is currently consulting on its plans. The announcement comes a day after it was revealed that a £3.5m monument commemorating the heroes of RAF Bomber Command who died during WWII, is set to be built in Green Park in London. The memorial, which should be built by 2012, will commemorate the 55,573 crew of Bomber Command, with an average age of 22, who were killed in the war. Its role was to attack Germany's airbases, troops, shipping and industries connected to the war effort. The memorial will contain inscriptions, carvings, and a dedication and also house a sculpture of the seven aircrew by sculptor Philip Jackson.